…one of the largest master bathroom suites you’ll probably ever see in a house in this price range (mid- $400’s). This master bathroom suite is as large, or larger, than many urban apartments! You could practically put a bowling alley in it! It’s that big!!! If you were so inclined, you could add a large high def TV and a fridge in the sitting area and you’ve got a bit of a man cave goin’ for ya. Not your typical man cave, mind you, but you wouldn’t need to go far for all of the necessities. The point I’m trying to make clear is that this bathroom is over-sized for most homeowners. There are many more great features of this home that I’d like to tell you about in this small, but well-situated neighborhood in one of the fastest growing counties in the U.S., but I’ll just stick with the master bathroom suite for now. Yes, it’s true. All of the features I mentioned in the lead-in paragraph are part of this master bathroom suite. It’s not all jammed together either. There’s plenty of room to walk around as you get ready for your day. The master bedroom is nice, but nothing special. What makes this master suite special is the bathroom itself and the custom walk-in closet. 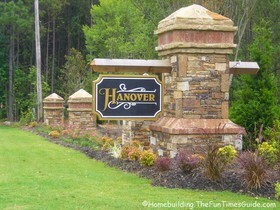 If you’re interested in a home priced in the mid-$400’s with a large amount of square footage devoted to the master suite, then hurry on over to this subdivision dubbed Hanover located near Hiram, GA and ask to see the Winsor (sic) floor plan.